The healthcare landscape in India is undergoing a paradigm shift, from symptomatic treatment to a consumer-leadership model, thanks to mobile apps, digitization of electronic health records, and wearable technologies. 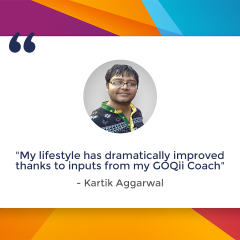 GOQii allows users to take charge of their health with proactive tools. As the genomics partner to this health ecosystem, Mapmygenome offers solutions that are personalized, predictive, preventive, and participatory. We help our customers understand their health risks early and make informed choices for mitigation. They go on to build healthy habits and to achieve their health goals. The first question that comes to the mind is – What is this technology and how does it work? 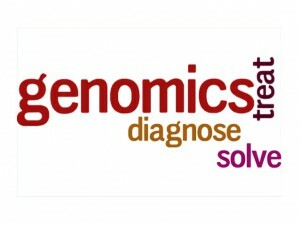 Genomics is the analysis of your genome, your unique DNA sequence that governs your health, habits, metabolism, physiology and psyche. Advances in technology have made it possible to read the whole or parts of individual’s DNA sequence. Experts analyze your DNA for variants at specific locations that can affect health and wellbeing. This information can be used to predict your risk for a particular disease, to diagnose a condition, to optimize treatment, or to move to a healthy lifestyle! With a simple swab of saliva, a personal genomics test can give you a complete profile of your genetic predisposition to health and lifestyle. While the genetic component does not change, factors such as environment, habits, and lifestyle can be modified to mitigate any genetic risks. Many people opt for comprehensive genomics service such as Genomepatri, which predicts individual’s genetic risk for 100+ health conditions, physiological traits, lifestyle, beauty and response to drugs. There are also tests like the BRCA gene test that Angelina Jolie took to understand her genetic risk for hereditary breast and ovarian cancer, which enabled her to make life-changing informed choices to prevent that risk from manifesting. Cutting down calories and physical activity are just two aspects of a successful weight loss program. There are other aspects – lean vs. fat mass, appetite and satiety levels, food interactions within your system, and genetic makeup have an impact on weight loss. Our genes have a significant role in functions such as fat tissue metabolism, excess fat storage, transport, brain signalling, and energy conversion. Individuals with certain variants of a specific gene have to work harder to burn calories than their luckier friends. Some people have a tendency to regain weight more easily. Nutritionists often recommend test such as Genomepatri Fit in order to recommend the most suitable diet and exercise plan for weight loss. They work in tandem with genetic counsellors. It is not easy for a layman to predict hereditary risk for a particular condition or to interpret findings from a genetic report. Genetic counsellors help you understand your health history and family history, and guide you in making informed choices towards better health. They explain your genetic report, correlate this information with your health history, and formulate a preventive action plan that works for you. It is said that answers can be found by one who seeks, but there are many who are scared to find out what their genes say. While this is a personal choice, one should remember that screening and predictive testing can actually enable prevention and early treatment at much lower costs – financial and emotional. A session with a genetic counsellor can be a good starting point. When we see kids playing on the playground, we know very well that these kids are active and love to move around. The benefits of being active as a kid are plenty namely developing strong bones and muscles, weight control, better sleep and a better attitude towards life as they grow up. Today, we are featuring one such child – Kashvi Khurana, as one of our active Sunday players from Gurgaon. 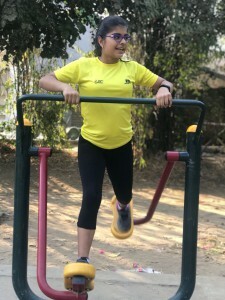 All of 11 years old, Kashvi’s journey to be active started when she got selected in her school sports team (Athletics -Track and Field) and since then she’s been asking her mother for a fitness tracking device. Then one day her normal digital watch broke down and that is when her mother Nishi Khurana decided to replace the digital watch with a fitness tracker-‘GOQii’ after comparing many other trackers available in the market. Kashvi’s happiness knew no bounds. 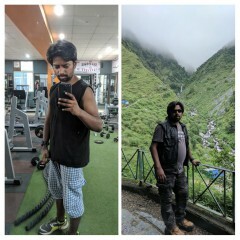 Kashvi has made few lifestyle changes such as having at least one fruit each day. She has also increased the protein portions of her diet (especially dals). 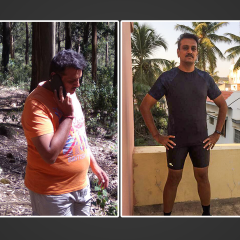 While she has made some progress on drinking at least 2 litres of water daily and reducing processed food intake, she has not completely achieved the target set for her on these two parameters. 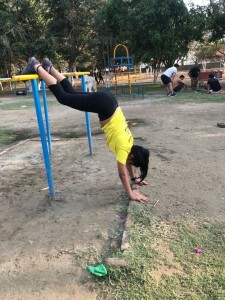 It’s nice to note that an 11-year-old is all gung-ho to wake up early on a Sunday morning and go for an outdoor exercise session. So what inspires Kashvi to do that? He mother says that initially, it was the 1000 GOQii cash that was an attraction to register for the first time. But, when she actually started attending she loved working out with the fantastic group. The Gurgaon Active Sunday group shares a great camaraderie, and they laugh and have fun while exercising. She made great friends despite being the only kid present among adults in the first few sessions. It’s not only on Sunday’s that Kashvi is active. On a daily basis, she has a very active lifestyle. She is part of the school sports team and has daily practice (moderate to intense) every morning Monday to Saturday from 6:00 am to 7:30 am. Apart from that, Kashvi has been training in Kathak for 6 years and has classes twice a week on Wednesdays and Saturdays for an hour each. She has also been training in roller speed skating (professional inline) and classes twice a week on Tuesday and Thursday for an hour and a half. Sunday was actually the only free day on her calendar and she willingly chooses to participate in Active Sundays. Kashvi has been focusing on being healthy and fit and loves all kinds of sports activities. Her message to all is at least pursue one sport or physical activity like dancing etc. and choose to lead a healthy lifestyle. Before I start with the article, I want my readers to try this. Let’s do a quick breathing test. -Keep one hand on your chest, one had on your belly. -Which hand is moving more? Hand on the belly or Hand on the chest? Do this test without reading ahead because it is important to do this without knowing the interpretation of the test. Which hand was moving more? If it’s your belly than its right way! That’s how one should breathe. If it’s your chest than its alarming, you might be inviting health issues! If you are not breathing properly, you might not feel good. In this busy world, breathing which is perhaps the only important thing, if we don’t do that properly then it’s a cause for concern. None of us is consciously breathing which is what is leading to health issues! I have come across this very often. Every 3rd person I know is having stiffness. Some part of the body is stiff (a Few years back, this was my case too!). Are you having neck stiffness? Is your back, shoulder, hamstrings, lower back tight/stiff? Do you have that constant urge to stretch your body to get rid of that stiffness? Stretching your muscles will definitely give you temporary relief but not for too long. The stiffness will come back in few hours sometimes even in two minutes. There are many therapies which help you in dealing with stiffness but it won’t be a permanent solution. Why is it so? Because you are not addressing the root cause of the problem! There are many other causes of stiffness but the most basic one is improper breathing technique. How does your improper breathing affect your stiffness/tightness? Put your one hand on your neck and one hand on your chest. Start breathing from your chest consciously. 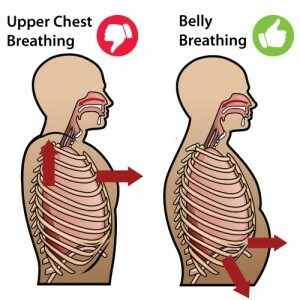 Do you feel that your neck muscles are contracting when you are breathing from your chest? Put your one hand on your neck and one hand on your belly. Start breathing from your belly consciously. Do you feel anything on your neck muscles? Probably not because there is hardly any contraction because there is hardly any muscle tension in that place. Not just the neck, similar reactions happen in your chest muscles, shoulders, lower back and to some extent even in the hamstrings. If you continuously breathe through your chest, those muscles will shorten, and you will get this chronic feeling of stiffness in your body. You can stretch your tight muscles every day with different stretching exercises but until you correct the way you breathe, any corrective efforts which you take for getting rid of the stiffness will be useless, and at the end you will not be able to get rid of that sensation of tightness/stiffness which you keep getting in your body throughout the day. 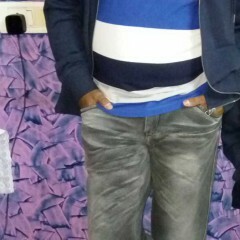 Stiffness is just once such effect of poor breathing. Poor breathing can also lead to lower back pain, weight plateau, poor endurance, low energy throughout the day and some digestive issues. What’s the solution? How to breathe properly? Well, the solution is not as complicated as you might think. Lie down for 5 minutes (this can be done first thing when waking up, or as you are lying in bed before you fall asleep or whenever you feel it is possible) put one hand on the belly and the other hand on your chest. Simply focus on making the hand on the belly move and keep the hand on the chest as steady as possible. Point 1 should be done every day for at least 3 times a day daily for at least 3 weeks. After 3 weeks, you should naturally be breathing into your stomach by default. This trick has helped me definitely, try it out for yourself! Try this for 3 weeks, and let me know what you feel! Would be happy to receive your comments! Share your experience! Fibre has a diverse role to play starting from improved laxation and lowering cardiovascular disease risk, weight management, etc. Due to drastic lifestyle changes overall and adopting the processed foods trend, has minimized the fibre level in our meals to a bare minimum. More amount of fibre in our diet makes the stool bulky which is due to the presence of fibre and absorbed water. This leads to easy defecation and hence acts as a natural laxative. Presence of enough fibre in our diet is therefore looked up in a condition such as constipation. 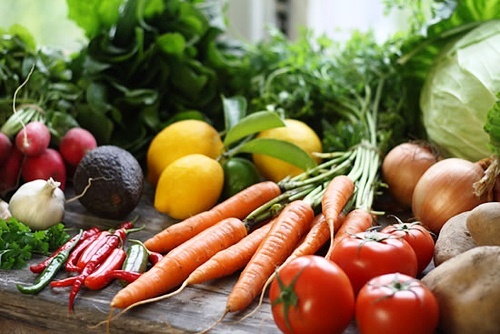 One of the simplest connections between fibre and sugar level is that high fibre food causes a slow release of glucose into the bloodstream and hence doesn’t shoot up the glucose level instantly. There is a number of studies which concludes that including more fibre in diet regulates the blood sugar levels. Hence diabetic person should always opt for high fibre food rather than refined stuff. Not just in diabetes, one can proactively start with high fibre meal right away as a preventive action against diabetes. The satiety centre in our brain gets activated after 20 minutes. So when you are eating fast you tend to eat more without any extra requirement. High fibre meals consume more time as it has to be chewed thoroughly to be able to gulp it. Hence the brain has enough time to activate the satiety centre. At the same time, high fibre meals are energy dense but, low in fat which also contributes to maintaining healthy body weight. Soluble fibre absorbs the cholesterol in the intestine which is eliminated in the stools and thereby makes it unavailable for the body. Apart from the cholesterol-lowering effect of fibre, it is also found to prevent hypertension and therefore also associated with lowering the risk of hypertension problems such as atherosclerosis, strokes etc. Fibre also acts as a prebiotic which helps in developing a healthy gut microflora in the intestine which contributes to the immune function. Some studies also say that there is more resistance to infection in an individual with consuming high fibre meals. As fibre plays such a diverse role in our health, there’s a need to look for fibre in our meals and make deliberate positive changes to add high fibre food in our diet like whole grains, fruits and vegetables, nuts and seeds, beans etc.